I made these for many years before I was married and then when my kids were little. The instructions I found online are different than the way I learned to make them, so here is the original method. You will need a roll of plastic food wrap (clear or colored), a LARGE bag of M & M's (colors to reflect the season, if you want), a wire clothes hanger and many twist ties. Shape the hanger into a circle. Using the plastic wrap, cut squares about 3-4 inches across. Take 5 candies and put them in the center of the square, gather up the corners and make a sack securing with a twist tie. Using the ends of the ties, secure the sack to the wire hanger. Continue making little sacks and attaching them to the hanger, pushing them down to make a fuller wreath, until the circle is filled (this will take some time, but its worth it). Attach a bow to the top of the hanger. Cut a piece of ribbon and tie one end to a small pair of scissors and the other to the wreath. Hang on a door and enjoy! I can imagine all kinds of candy doing this - even pre-wrapped "kisses" or candy of anyone's choice. Could then also use for different "holidays" like Valentines or maybe July 4th when kisses comes out with colors...I would still use the plastic wrap technique. Sure, Judie...you could use conversation hearts or cinnamon hearts for Valentines day. They make the pastel M & M's for Easter, too. And then there's candy corn for Halloween. I couldn't find a picture either, I guess Sandy is going to have to make one and take a pic for us Then you can add it to the M&M Bright Idea site to share with everyone and become famous! It's gooey rice crispies formed into a ring and covered with M&Ms. I says to 'slice to eat'. How's that for a sugar rush?! Mini, I would love to take credit for it, but I originally got the directions out of a women's magazine from an M & M advertisement many moons ago when I was a teenager. I will look for a photo. 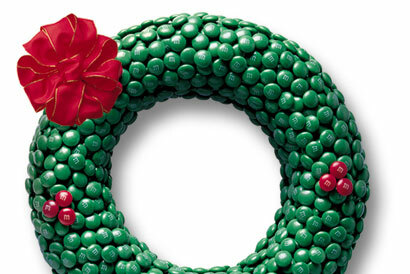 That wreath looks incredible.....and I love Rice Krispies Treats!